Angiogenesis inhibitors were once thought to have potential as a "silver bullet" treatment applicable to many types of cancer, but the limitations of anti-angiogenic therapy have been shown in practice. Nonetheless, inhibitors are used to effectively treat cancer, macular degeneration in the eye, and other diseases that involve a proliferation of blood vessels. When a tumor stimulates the growth of new vessels, it is said to have undergone an 'angiogenic switch'. The principal stimulus for this angiogenic switch appears to be oxygen deprivation, although other stimuli such as inflammation, oncogenic mutations and mechanical stress may also play a role. The angiogenic switch leads to tumor expression of pro-angiogenic factors and increased tumor vascularization. Specifically, tumor cells release various pro-angiogenic paracrine factors (including angiogenin, vascular endothelial growth factor (VEGF), fibroblast growth factor (FGF), and transforming growth factor-β (TGF-β). These stimulate endothelial cell proliferation, migration and invasion resulting in new vascular structures sprouting from nearby blood vessels. Cell adhesion molecules, such as integrins, are critical to the attachment and migration of endothelial cells to the extracellular matrix. Inhibiting angiogenesis requires treatment with anti-angiogenic factors, or drugs which reduce the production of pro-angiogenic factors, prevent them binding to their receptors or block their actions. Inhibition of the VEGF pathway has become the focus of angiogenesis research as approximately 60% of malignant tumors express high concentrations of VEGF. Strategies to inhibit the VEGF pathway include antibodies directed against VEGF or VEGFR, soluble VEGFR/VEGFR hybrids, and tyrosine kinase inhibitors. The most widely used VEGF pathway inhibitor on the market today is Bevacizumab. Bevacizumab binds to VEGF and inhibits it from binding to VEGF receptors. Angiogenesis is regulated by the activity of endogenous stimulators and inhibitors. Endogenous inhibitors are found in the body naturally and involved in the day-to-day process of regulating blood vessel formation. Endogenous inhibitors are often derived from the extracellular matrix or basement membrane proteins and function by interfering with endothelial cell formation and migration, endothelial tube morphogenesis, and down-regulation of genes expressed in endothelial cells. During tumor growth, the action of angiogenesis stimulators surpasses the control of angiogenesis inhibitors, allowing for unregulated or less regulated blood vessel growth and formation. Endogenous inhibitors are attractive targets for cancer therapy because they are less toxic and less likely to lead to drug resistance than some exogenous inhibitors. However, the therapeutic use of endogenous inhibitors has disadvantages. In animal studies, high doses of inhibitors were required to prevent tumor growth and the use of endogenous inhibitors would likely be long-term. One of the most recent methods that is being developed for the delivery of anti-angiogenesis factors to tumour regions in cancer sufferers is using genetically modified bacteria that are able to colonize solid tumors in vivo. This method involves genetically engineering bacterial species such as Clostridium, Bifidobacteria and Salmonella by adding the genes for anti-angiogenic factors such as endostatin or IP10 chemokine and removing any harmful virulence genes. A target can also be added to the outside of the bacteria so that they are sent to the correct organ in the body. The bacteria can then be injected into the patient and they will locate themselves to the tumor site, where they release a continual supply of the desired drugs in the vicinity of a growing cancer mass, preventing it form being able to gain access to oxygen and ultimately starving the cancer cells. This method has been shown to work both in vitro and in vivo in mice models, with very promising results. It is expected that this method will become commonplace for treatment of various cancer types in humans in the future. Research and development in this field has been driven largely by the desire to find better cancer treatments. Tumors cannot grow larger than 2mm without angiogenesis. By stopping the growth of blood vessels, scientists hope to cut the means by which tumors can nourish themselves and thus metastasize. In addition to their use as anti-cancer drugs, angiogenesis inhibitors are being investigated for their use as anti-obesity agents, as blood vessels in adipose tissue never fully mature, and are thus destroyed by angiogenesis inhibitors. Angiogenesis inhibitors are also used as treatment for the wet form of macular degeneration. By blocking VEGF, inhibitors can cause regression of the abnormal blood vessels in the retina and improve vision when injected directly into the vitreous humor of the eye. itraconazole inhibits VEGFR phosphorylation, glycosylation, mTOR signaling, endothelial cell proliferation, cell migration, lumen formation, and tumor associated angiogenesis. Mechanism of action of angiogenesis inhibitors. Bevacizumab binds to VEGF inhibiting its ability to bind to and activate VEGF receptors. 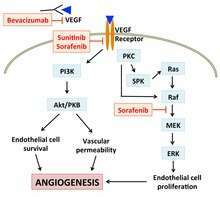 Sunitinib and Sorafenib inhibit VEGF receptors. Sorafenib also acts downstream. Through binding to VEGFR and other VEGF receptors in endothelial cells, VEGF can trigger multiple cellular responses like promoting cell survival, preventing apoptosis, and remodeling cytoskeleton, all of which promote angiogenesis. Bevacizumab (brand name Avastin) traps VEGF in the blood, lowering the binding of VEGF to its receptors. This results in reduced activation of the angiogenesis pathway, thus inhibiting new blood vessel formation in tumors. After a series of clinical trials in 2004, Avastin was approved by the FDA, becoming the first commercially available anti-angiogenesis drug. FDA approval of Avastin for breast cancer treatment was later revoked on November 18, 2011. Despite the therapeutic potential of anti-angiogenesis drugs, they can also be harmful when used inappropriately. Thalidomide is one such antiangiogenic agent. Thalidomide was given to pregnant women to treat nausea. However, when pregnant women take an antiangiogenic agent, the developing fetus will not form blood vessels properly, thereby preventing the proper development of fetal limbs and circulatory systems. In the late 1950s and early 1960s, thousands of children were born with deformities, most notably phocomelia, as a consequence of thalidomide use. According to a study published in the August 15, 2004 issue of the journal Cancer Research, cannabinoids, the active ingredients in marijuana, restrict the sprouting of blood vessels to gliomas (brain tumors) implanted under the skin of mice, by inhibiting the expression of genes needed for the production of vascular endothelial growth factor (VEGF). Phellinus linteus mushrooms (via active substance Interfungins A inhibition of glycation). Bleeding is one of the most difficult side effects to manage this complication is somewhat inherent to the effectiveness of the drug. Bevacizumab has shown to be the drug most likely to cause bleeding complications. While the mechanisms of bleeding induced by anti-VEGF agents are complicated and not yet totally understood, the most accepted hypothesis is that VEGF could promote endothelial cell survival and integrity in the adult vasculature and its inhibition may decrease capacity for renewal of damaged endothelial cells. In a study done by ML Maitland, a mean blood pressure increase of 8.2 mm Hg systolic and 6.5 mm Hg diastolic was reported in the first 24 hours after the first treatment with sorafenib, a VEGF pathway inhibitor. Because these drugs act on parts of the blood and blood vessels, they tend to have side effects that affect these processes. Aside from problems with hemorrhaging and hypertension, less common side effects of these drugs include dry, itchy skin, hand-foot syndrome (tender, thickened areas on the skin, sometimes with blisters on palms and soles), diarrhea, fatigue, and low blood counts. Angiogenesis inhibitors can also interfere with wound healing and cause cuts to re-open or bleed. Rarely, perforations (holes) in the intestines can occur. ↑ Hayden, Erika C. (2009-04-08). "Cutting off cancer's supply lines". Nature. 458 (7239): 686–687. doi:10.1038/458686b. PMID 19360048. ↑ Cancer.com [homepage on the Internet]. National Cancer Institute at the National Institutes of Health; 2011 [cited 18 March 2014]. Available from: "Archived copy". Archived from the original on 2015-02-08. Retrieved 2007-01-26. ↑ Eugene W. M. Ng & Anthony P. Adamis (June 2005). "Targeting angiogenesis, the underlying disorder in neovascular age-related macular degeneration". Canadian journal of ophthalmology. Journal canadien d'ophtalmologie. 40 (3): 352–368. doi:10.1016/S0008-4182(05)80078-X. PMID 15947805. 1 2 3 4 Folkman J (2004). "Endogenous angiogenesis inhibitors". APMIS. 112 (7–8): 496–507. doi:10.1111/j.1600-0463.2004.apm11207-0809.x. PMID 15563312. 1 2 Cao Y (April 2001). "Endogenous angiogenesis inhibitors and their therapeutic implications". Int. J. Biochem. Cell Biol. 33 (4): 357–69. doi:10.1016/s1357-2725(01)00023-1. PMID 11312106. ↑ Rini, BI. (Feb 2007). "Vascular endothelial growth factor-targeted therapy in renal cell carcinoma: current status and future directions". Clin Cancer Res. 13 (4): 1098–106. doi:10.1158/1078-0432.CCR-06-1989. PMID 17317817. 1 2 3 Nyberg P; Xie L; Kalluri R (May 2005). "Endogenous inhibitors of angiogenesis". Cancer Res. 65 (10): 3967–79. doi:10.1158/0008-5472.CAN-04-2427. PMID 15899784. ↑ Kamphaus, GD. ; Colorado, PC. ; Panka, DJ. ; Hopfer, H.; Ramchandran, R.; Torre, A.; Maeshima, Y.; Mier, JW. ; et al. (Jan 2000). "Canstatin, a novel matrix-derived inhibitor of angiogenesis and tumor growth". J Biol Chem. 275 (2): 1209–15. doi:10.1074/jbc.275.2.1209. PMID 10625665. ↑ Lee, SJ. ; Nathans, D. (Mar 1988). "Proliferin secreted by cultured cells binds to mannose 6-phosphate receptors". J Biol Chem. 263 (7): 3521–7. PMID 2963825. ↑ Gardlik, R., Behuliak, M., Palffy, R., Celec, P., & Li, C. J. (2011). Gene therapy for cancer: bacteria-mediated anti-angiogenesis therapy. Gene therapy, 18(5), 425-431. ↑ Xu, Y. F., Zhu, L. P., Hu, B., Fu, G. F., Zhang, H. Y., Wang, J. J., & Xu, G. X. (2007). A new expression plasmid in Bifidobacterium longum as a delivery system of endostatin for cancer gene therapy. Cancer gene therapy, 14(2), 151-157. ↑ Bruemmer, D. (2012). "Targeting Angiogenesis as Treatment for Obesity". Arteriosclerosis, Thrombosis, and Vascular Biology. 32 (2): 161–162. doi:10.1161/ATVBAHA.111.241992. ISSN 1079-5642. ↑ Jeffrey S. Heier (May 2013). "Neovascular age-related macular degeneration: individualizing therapy in the era of anti-angiogenic treatments". Ophthalmology. 120 (5 Suppl): S23–S25. doi:10.1016/j.ophtha.2013.01.059. PMID 23642783. ↑ Chong, Curtis R.; Xu, Jing; Lu, Jun; Bhat, Shridhar; Sullivan, David J.; Liu, Jun O. (2007). "Inhibition of Angiogenesis by the Antifungal Drug Itraconazole". ACS Chemical Biology. 2 (4): 263–70. doi:10.1021/cb600362d. PMID 17432820. ↑ Aftab, B. T.; Dobromilskaya, I.; Liu, J. O.; Rudin, C. M. (2011). "Itraconazole Inhibits Angiogenesis and Tumor Growth in Non-Small Cell Lung Cancer". Cancer Research. 71 (21): 6764–72. doi:10.1158/0008-5472.CAN-11-0691. PMC 3206167 . PMID 21896639. ↑ Xu, J.; Dang, Y.; Ren, Y. R.; Liu, J. O. (2010). "Cholesterol trafficking is required for mTOR activation in endothelial cells". Proceedings of the National Academy of Sciences. 107 (10): 4764–9. doi:10.1073/pnas.0910872107. PMC 2842052 . PMID 20176935. ↑ "Evolving Therapeutic Paradigms for Advanced Prostate Cancer". 2011. ↑ Rosenfeld, Philip J.; Brown, David M.; Heier, Jeffrey S.; Boyer, David S.; Kaiser, Peter K.; Chung, Carol Y.; Kim, Robert Y. (2006). "Ranibizumab for Neovascular Age-Related Macular Degeneration". New England Journal of Medicine. 355 (14): 1419–1431. doi:10.1056/NEJMoa054481. ISSN 0028-4793. PMID 17021318. ↑ Kim, J. H.; Scialli, A. R. (2011). "Thalidomide: The Tragedy of Birth Defects and the Effective Treatment of Disease". Toxicological Sciences. 122 (1): 1–6. doi:10.1093/toxsci/kfr088. ISSN 1096-6080. PMID 21507989. ↑ Cristina Blázquez; Luis González-Feria; Luis Álvarez; Amador Haro; M. Llanos Casanova; Manuel Guzmán (August 15, 2004). "Cannabinoids Inhibit the Vascular Endothelial Growth Factor Pathway in Gliomas". Cancer Research. 64 (16): 5617–5623. doi:10.1158/0008-5472.CAN-03-3927. PMID 15313899. ↑ Farina HG, Pomies M, Alonso DF, Gomez DE (October 2006). "Antitumor and antiangiogenic activity of soy isoflavone genistein in mouse models of melanoma and breast cancer". Oncol. Rep. 16 (4): 885–91. doi:10.3892/or.16.4.885. PMID 16969510. ↑ Kimura, Y; Kido, T; Takaku, T; Sumiyoshi, M; Baba, K (2004). "Isolation of an anti-angiogenic substance from Agaricus blazei Murill: its antitumor and antimetastatic actions". Cancer Sci. 95 (9): 758–764. doi:10.1111/j.1349-7006.2004.tb03258.x. PMID 15471563. ↑ Takaku T, Kimura Y, Okuda H (May 2001). "Isolation of an antitumor compound from Agaricus blazei Murill and its mechanism of action". J. Nutr. 131 (5): 1409–13. PMID 11340091. ↑ Liu, Zhijun. ; Schwimer, Joshua. ; Liu, Dong. ; Greenway, Frank L.; Anthony, Catherine T.; Woltering, Eugene A. Black Raspberry Extract and Fractions Contain Angiogenesis Inhibitors. ACS Publications. ↑ Stanley, Gwenaelle; Harvey, Kevin; Slivova, Veronika; Jiang, Jiahua; Sliva, Daniel (2005). "Ganoderma lucidum suppresses angiogenesis through the inhibition of secretion of VEGF and TGF-β1 from prostate cancer cells". Biochemical and Biophysical Research Communications. 330 (1): 46–52. doi:10.1016/j.bbrc.2005.02.116. PMID 15781230. ↑ Fisher, M. Y.; Yang, L. X. (May 2002). "Anticancer effects and mechanisms of polysaccharide-K (PSK): implications of cancer immunotherapy". Anticancer research. 22 (3): 1737–1754. ISSN 0250-7005. PMID 12168863. ↑ Kobayashi, H; Matsunaga, K; Oguchi, Y (1995). "Antimetastatic effects of PSK (Krestin), a protein-bound polysaccharide obtained from basidiomycetes: An overview". Cancer epidemiology, biomarkers & prevention. 4 (3): 275–81. PMID 7606203. ↑ Lee, Jong-Suk; Park, Byung Chul; Ko, Yu Jin; Choi, Mi Kyoung; Choi, Han Gon; Yong, Chul Soon; Lee, Jae-Sung; Kim, Jung-Ae (2008). "Grifola frondosa(Maitake Mushroom) Water Extract Inhibits Vascular Endothelial Growth Factor-Induced Angiogenesis Through Inhibition of Reactive Oxygen Species and Extracellular Signal-Regulated Kinase Phosphorylation". Journal of Medicinal Food. 11 (4): 643–51. doi:10.1089/jmf.2007.0629. PMID 19053855. ↑ Sliva, D, Jedinak, A, Kawasaki, J, Harvey, K, Slivova, V (2008). "Phellinus linteus suppresses growth, angiogenesis and invasive behaviour of breast cancer cells through the inhibition of AKT signalling". British Journal of Cancer. 98 (8): 1348–1356. doi:10.1038/sj.bjc.6604319. PMC 2361714 . PMID 18362935. ↑ Lee YS, Kang YH, Jung JY, et al. (October 2008). "Protein glycation inhibitors from the fruiting body of Phellinus linteus". Biological & Pharmaceutical Bulletin. 31 (10): 1968–72. doi:10.1248/bpb.31.1968. PMID 18827365. ↑ Rodriguez, Shaun K.; Guo, Weimin; Liu, Liping; Band, Michael A.; Paulson, Eric K.; Meydani, Mohsen (2006). "Green tea catechin, epigallocatechin-3-gallate, inhibits vascular endothelial growth factor angiogenic signaling by disrupting the formation of a receptor complex". International Journal of Cancer. 118 (7): 1635–44. doi:10.1002/ijc.21545. 1 2 Smith, Roderick. Antiangiogenic Substances in Blackberries, Licorice May Aid Cancer Prevention. The Angiogenesis Foundation. 6 May 2009. ↑ Jeong, Soo-Jin; Koh, Wonil; Lee, Eun-Ok; Lee, Hyo-Jung; Lee, Hyo-Jeong; Bae, Hyunsu; Lü, Junxuan; Kim, Sung-Hoon (2011). "Antiangiogenic phytochemicals and medicinal herbs". Phytotherapy Research. 25 (1): 1–10. doi:10.1002/ptr.3224. PMID 20564543. ↑ Izuta, Hiroshi; Chikaraishi, Yuichi; Shimazawa, Masamitsu; Mishima, Satoshi; Hara, Hideaki (2009). "10-Hydroxy-2-decenoic Acid, a Major Fatty Acid from Royal Jelly, Inhibits VEGF-Induced Angiogenesis in Human Umbilical Vein Endothelial Cells". Evidence-Based Complementary and Alternative Medicine. 6 (4): 489–94. doi:10.1093/ecam/nem152. PMC 2781774 . PMID 18955252. 1 2 Elice, F; Rodeghiero, F (2012). "Side effects of anti-angiogenic drugs.". Thrombosis Research. 129 Suppl 1: 50–3. doi:10.1016/S0049-3848(12)70016-6. PMID 22682133. ↑ Maitland, ML; Kasza, K. E.; Karrison, T; Moshier, K; Sit, L; Black, H. R.; Undevia, S. D.; Stadler, W. M.; Elliott, W. J.; Ratain, M. J. (2009). "Ambulatory Monitoring Detects Sorafenib-Induced Blood Pressure Elevations on the First Day of Treatment". Clinical Cancer Research. 15 (19): 6250–7. doi:10.1158/1078-0432.CCR-09-0058. PMC 2756980 . PMID 19773379.